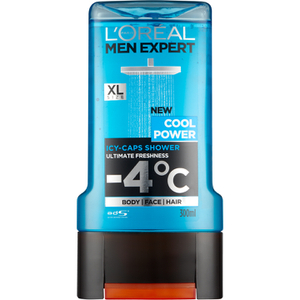 Freshen up with the Men Expert Hydra Cool Power Shower Gel from L'Oréal Paris. The 3-in-1 wash is suitable for the face, hair and body and is designed have a cooling effect on the skin’s temperature, leaving skin feeling clean and incredibly fresh. Bursting with a cool and minty fragrance, the gel cleans and cleanses without leaving skin dry or tight. Aqua / Water, Sodium Laureth Sulfate, Glycerin, Sodium Chloride, Coco-Betaine, CI 42090 / Blue 1, CI 14700 / Red 4, Sodium Benzoate, Sodium Acetate, Sodium Hydroxide, Ppg-5-Ceteth-20, Polyquaternium-10, Salicylic Acid, Limonene, Menthol, Linalool, Pentylene Glycol, Mentha, Piperi Ta Extract / Peppermint Extract, Isopropyl Alcohol, Parfum / Fragrance, Citric Acid, Hexyl Cinnamal, F.I.L. C185161/1.